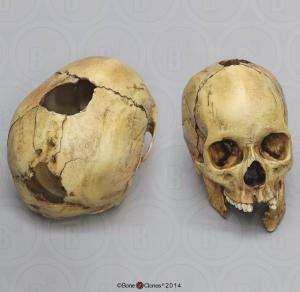 This human skull displays the trauma inflicted by at least one shotgun round. This skull contains one gaping defect on the occiput involving the lambda; internal beveling is palpable along the edges of the wound. The second defect is along the sagittal suture just below the coronal suture; subtle scalloping is along the edges of this defect, and shallow internal beveling is palpable. Fractures radiate from both defects. It's not possible to definitively state whether these are entry and exit wounds of one shot or the result of two shotgun blasts.